The Baryonyx (bare-ee-ON-iks) is one of the dinosaurs in ARK: Survival Evolved. Like the Carnotaurus, Baryonyx aquafulguar is a large carnivore, but not large enough to rival the Island's apex predators. While not as powerful as some deep-sea predators or Spinosaurus, Baryonyx is an extremely fast swimmer who is still sufficiently nimble enough to threaten most creatures on the Island. And yet despite being a fast, dangerous dinosaur, Baryonyx almost exclusively consumes fish and other water-dwellers. The highly specific metabolism of Baryonyx seems to allow it to heal wounds almost preternaturally fast after feeding on nutritious fish meat. Perhaps this is why Baryonyx rarely attacks land animals? Baryonyx's natural affinity for aquatic predation means that once tamed; it learns to kill ocean-dwellers even more efficiently. Between its speed and its power, Baryonyx makes an ideal choice for anyone interested in frequently moving between water and land travel, and who values speed and agility over raw strength. It lives near bodies of water, due to the fact that it eats fish as its main diet. It is also a very good swimmer, sometimes needing to go out into the water to get its prey, however, it is also said that its long claws are for catching prey on land, not just in water. Despite what the dossier states, a Baryonyx will target any nearby players, mounts or wild creatures, regardless of whether they are on land or in water. While this creature is not the fastest swimming mount (Slower than Megalodon during sprint, at base) its ability to temporarily stun creatures (Duration- 10 seconds) with its spin attack can make the Baryonyx an adept aquatic mount or fighter. Note- the stun does not function on very small, dangerous creatures such as Cnidaria, nor very large, dangerous creatures such as Mosasaurs. Unless your target is medium-sized, the targets will only be damaged. Additionally, much like the Kaprosuchus, the Baryonyx will surface in a more diagonal trail rather than a directly vertical path, making it slightly more difficult to escape from Mosasaurs and Plesiosaurs. Baryonyx resembles a typical mid-sized carnivorous dinosaur except for its crocodile-like head with serrated teeth and having longer arms with large claws. These features are specially adapted to the animal's diet of fish and other water-dwellers. It looks somewhat like a hybrid of a Kaprosuchus and Spinosaurus, and is about the size of a Carnotaurus. This section displays the Baryonyx's natural colors and regions. For demonstration, the regions below are colored red over an albino Baryonyx. The colored squares shown underneath each region's description are the colors that the Baryonyx will randomly spawn with to provide an overall range of its natural color scheme. Hover your cursor over a color to display its name and ID. For example, "cheat SetTargetDinoColor 0 6" would color the Baryonyx's "body" magenta. Taming a Baryonyx is similar to taming an individual Raptor. Simply Bola one and knock it out. Ingredients for Regular Kibble: 1 × Cooked Meat Jerky , 1 × Medium Egg , 5 × Fiber , 2 × Longrass , 2 × Savoroot , 1 × Water Note that the values are for optimal cases, always bring extra supplies! This section describes how to fight against the Baryonyx. The Baryonyx is usually seen along shore lines. It is a highly aggressive predator, and will pursue its prey to death, unless its Torpor gets too high. Killing a Baryonyx on land is rather straightforward, being as frail of a creature as it is. Shooting it from a ledge or hitting it with a Sword will defeat it rather quickly. Attacking it with tamed creatures will finish it off with even less effort. This changes when in the water. Due to its ability to stun lock creatures when in the water it is highly advised to avoid combating it in its element. Kite the Baryonyx out of the water to finish it off with arrows, bullets, or your tamed creatures. On land a Baryonyx can be taken out with firearms, melee weapons, and with tamed creatures rather quickly. In water however it is advised to rely solely on ranged weaponry if it comes down to it. Baryonyx is a rather frail creature, and can be easily defeated once out of the water. A Bola can immobilize it, and then it's really easy to kill with any ranged weapon. It can also be picked up by the Argentavis and killed while in its talons. Aquatic Battle Mount: With a dangerous tail-spin attack that can be used to dismount, and temporarily stun, other players, allowing the rider to attack(only usable while swimming). The Baryonyx also does bonus damage to some river-dwelling creatures such as Spinos and Sarcos. There are certainly other creatures affected as well and tests need to be done on each creature to get an accurate representation. Bonus damage is roughly 20%. 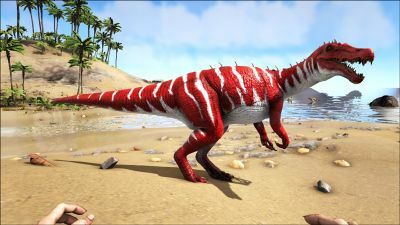 Starter mount: The ability to acquire large amounts of Prime Fish Meat(Sabertooth Salmon + Sickle), longer spoil times on Prime Fish Meat, low torpor drop rate, ability to stun many tougher dinos(while swimming), fast movement speed in water and on land make the Baryonyx a very viable mount for early game players. They can also be used late game as their lack of oxygen stat and ability to sprint underwater makes them viable to a large amount of players. Is a good upgrade In-between the Raptor to an Allosaurus or a Spino. Underwater Miner: While not being able to mine on its own; players are able to equip weapons and tools while riding a Baryonyx. Providing access to underwater resources such as Oil and Silica Pearls. Since they do not require oxygen the player has no concerns about the Baryonyx wanting to surface after dismounting to gather the pearls. Taming Basilosaurus: Taming a Basilosaurus often entails killing the group of Mantas surrounding it. Because of the Baryonyx's ability to stun underwater creatures with its tail spin attack(right click), it can easily stun the Manta group repeatedly and allow the easy killing of them while they are immobilized. There is not a long cooldown for the spin so it can be done repeatedly to keep the Mantas at bay until they have all been dealt with. Island Caver: With the exception of the two ice and ocean caves, Baryonyx can easily reach, freely enter, complete, and exit all other artifact caves on the The Island. Possessing reasonable jumping skills and maneuverability, capable of moving effectively between land and aquatic travel, and the ability to quickly heal while consuming dead fish; a well-bred and strong-saddled Baryonyx makes collecting artifacts for boss battles a breeze. Just remember to bring in a supply of raw fish if the cave lacks Piranhas to feed from, in the case your Bary needs a brief healing session, and always take into account the standard precautions for caving: spare supplies, such as extra armor, food, water, antidotes, and medical brews, to name a few. It is possible to do Lower South Cave and The Middle Chamber on a Baryonyx. Dino Dossier revealed on 08/14/2015. The dossier mentions the ability to recover health faster after ingesting fish. 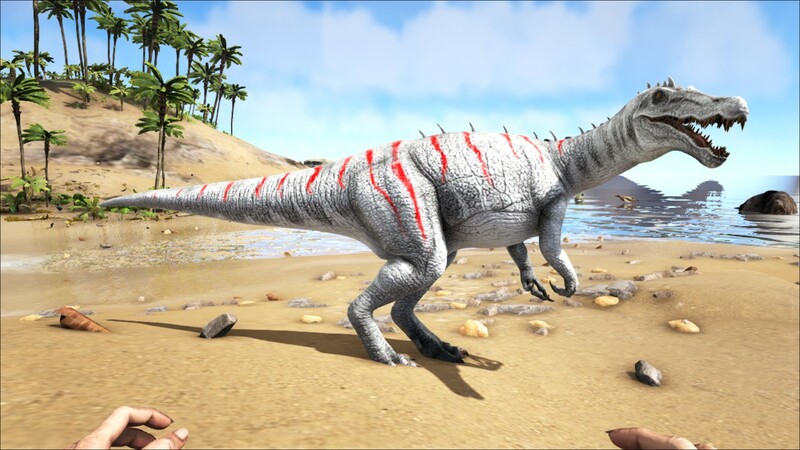 Tests have shown that remote using raw fish meat in a Baryonyx restores 7.5 health per fish meat, as opposed to 1.5 when used on other dinosaurs. However it gains no effect from remote using regular raw meat. It will only eat fish meat. Leeches will ignore a tamed Baryonyx even if you are riding it. If you attack a Leech, only the surviving Leeches will attack back. Baryonyx's scientific name translates to 'Heavy claw'. Baryonyx's specific name means "Water Lightning". Surprisingly the Baryonyx can be picked up by an Argentavis. Larger predators (Rexs for example) will ignore a tamed Baryonyx in the water, even if you attack the predator before entering water or attack it in the water. Note that this only applies if the Baryonyx is swimming, not in shallow water(has to be doing the "swimming/floating" animation). The Baryonyx's "tail spin" attack (rmb, , ) only stuns creatures of comparable size to the Baryonyx - for example, it will not stun a Trilobite or a Coel (both too small), but it will stun a Megalodon or Manta. Larger creatures such as Pleisiosaurs and Mosasaurus are immune. Notably, Cnidaria are immune as well, and the Baryonyx is vulnerable to both of those creatures' stuns. Eel's can be stunned, but can knock you off, so it's a careful act to balance. Baryonyx is a member of the same family as Spinosaurus, known as the Spinosauridae. Fossils of Baryonyx have been found with the remains of other dinosaurs, meaning that despite being a fish-eating predator, Baryonyx was probably capable of taking on larger land animals, despite the dossier stating it rarely attacks land animals. Despite it's usually frail and tiny body in-game, it can take on Wild Spinos if the water is deep enough usually by using the Spino's turn radius to it's advantage. This page was last edited on 13 April 2019, at 19:01.